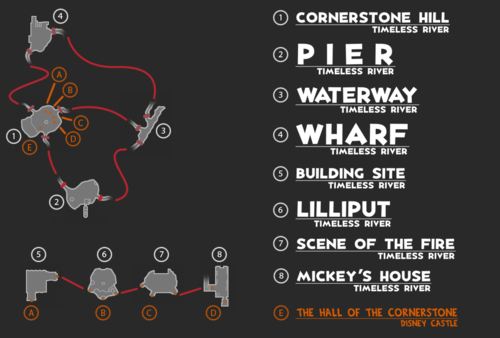 Timeless River is a world from the past in Kingdom Hearts II. Entered through a door in the Hall of the Cornerstone at Disney Castle, Timeless River is an area back in time to when the world was still monochrome and the Castle had not been built. It is largely based on the 1928 short Steamboat Willie, as well as many other classic Disney shorts. Mono (single channel) sound is used in this world, as well as an audio filter which adds static and pops to game sounds, reminiscent of the original short film. Pete comes to the Timeless River as part of a wish to return to simpler days, which Maleficent takes advantage of and works into her plans. Heartless invade the sacred land and capture the Cornerstone of Light. This is because the Disney Castle of the future wouldn't have any way to protect itself leaving it vulnerable to the Heartless. The Heartless found in the Timeless River are surrealistic and bizarre. Many of them are toy-like. Instances include the Hot Rod, which is a cartoonish car, and the Aeroplane, which is a toy airplane. Sora and his friends encountered the Mickey Mouse of the past several times, along with the good (but equally rude) Pete of the past. The boss of the Timeless River is the bad Pete from the future, with the Pete from the past helping Sora in the battle. The wharf in Timeless River. Sora and his party enter the Timeless River on Cornerstone Hill (礎の丘, Ishizue no Oka? ), where they find the Cornerstone of Light unprotected but still safe. Signs around the area announce the impending construction of Disney Castle, and Clara Cluck, Clarabelle Cow, and Horace Horsecollar are around to chat with, as is a Moogle shop. Heading to the right leads to the Pier (桟橋, Sanbashi? ), where the party meets up with young Pete for the first time and knocks some sense into him. Continuing on the other path will take the party to the Waterway (水門, Suimon?, lit. "Floodgate"), site of the battle with modern Pete for the Steamboat Willie, and the Wharf (停泊所, Teihaku-sho? ), where young Pete and Sora's group begin the final boss battle with Pete to finish Timeless River. The Building Site (摩天楼, Matenrō?, lit. "Skyscraper"), a high-altitude construction site with a rickety platform. It is based on the 1933 short Building a Building. Lilliput (ガリバータウン, Garibā Taun?, lit. "Gulliver Town"), a tiny town with a big cannon that can be activated by jumping on it. It is from the 1934 short Gulliver Mickey. The Scene of the Fire (火災現場, Kasai Genba? ), a big building with fierce flames that was inspired by the 1930 short The Fire Fighters and the 1935 short Mickey's Fire Brigade. Mickey's House (ミッキーの家, Mikkī no Ie? ), which shows the inside of Mickey's House, decorated for Christmas, from the 1931 short Mickey's Orphans. Arriving in a spectacular fashion, Sora, Donald, and Goofy work out that they have gone back to a place in time before Disney Castle was built, where the unprotected Cornerstone sits on a quiet hill. Before they can get much farther in the world, an oddly retro Pete belligerently runs past them. They chase him down and accuse him of trying to do something with the Cornerstone, but after a fight, the three realize they have just beaten on the wrong Pete. They return to the Hill and spot Heartless jumping into the four windows from the past. They also find a fifth window, which shows how the present Pete's desire to return to his simpler life as a steamboat captain created a door into the past in the first place. The party then leaps into each window, fighting off the Heartless there and discovering new windows that detail Maleficent's plan to take advantage of her lackey's porthole to the past to weaken the defenses of the present Disney Castle. Upon exiting the last window, the party is aghast to find the Cornerstone missing. They manage to catch up with it at the Pier, in the possession of present Pete, who has also taken the past Pete's beloved Steamboat Willie to transport it. Sora and his party manage to defeat Pete and retake both the Cornerstone and the steamboat. They return the Cornerstone to the hill, and then catch up with past Pete at the Wharf, where he joins the party in a battle against the present Pete to expel him from Timeless River for good. Present Pete is soundly thrashed and is sent fleeing back to Maleficent; Sora locks his door into Timeless River so he cannot return. The Cornerstone and the present Disney Castle safe at last, the three are offered a reward by past Pete: a chance to pilot his beloved steamboat. After all, his pesky cabin boy never showed up for work. In Timeless River, Sora, Donald, and Goofy, are converted into black and white versions based on their original appearances. Sora appears in his original outfit from Kingdom Hearts, and is depicted reminiscent of Osamu Tezuka's style. Donald's appearance goes back to his 1934 debut in The Wise Little Hen, and Goofy resembles his original 1932 appearance (though a lot younger here) in Mickey's Revue. Present Pete, on the other hand, remains relatively unchanged save for sporting a black and white appearance. Sora in his Timeless River version. Donald Duck in his Timeless River version. Goofy in his Timeless River version. Timeless River is one of the few worlds in the game to have a change of day, as in the "Scene of the fire" area, it is clearly seen to be nighttime. 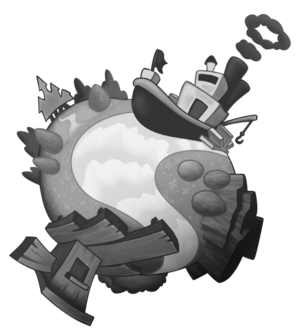 Timeless River is also one of the few worlds in the game to not feature Nobodies in any way, shape or form, even after the increase in battle level.